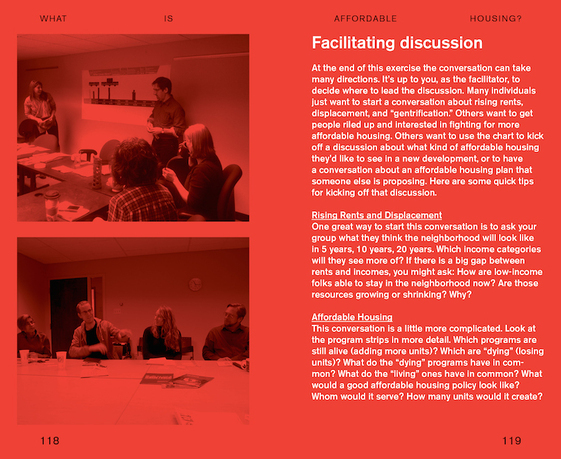 Center for Urban Pedagogy, What is Affordable Housing? Guidebook workshop sample page. © 2015, Center for Urban Pedagogy. 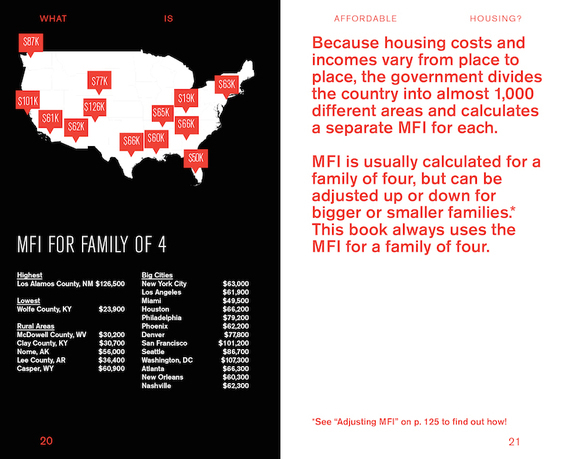 The phrase "affordable housing" seems plain enough, but it doesn't always mean what people think it does. It actually has a technical definition, which can determine what gets built and who gets to live there. 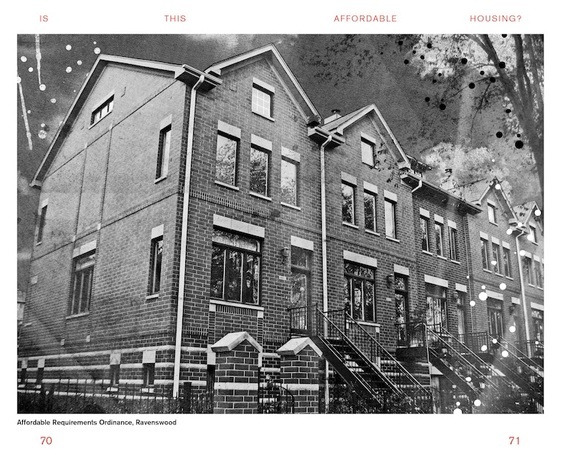 The Affordable Housing Toolkit (Chicago Edition) helps communities answer the all-important question, "Affordable to whom?" It helps grassroots organizations advocate for more equitable community development. 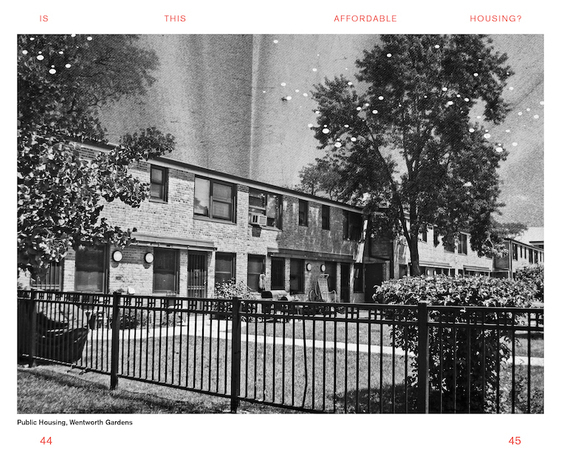 Chicago has a huge gap in affordable housing, especially for the lowest-income communities. Affordability is calculated using citywide demographics, which can often skew the availability of housing towards higher-income brackets. Private developers include affordable housing in new construction, but the question remains if it reaches those who have the greatest need for it. 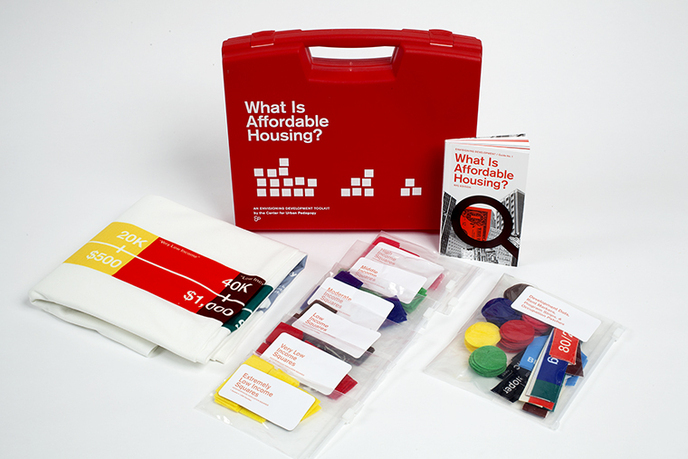 The Affordable Housing Toolkit includes an interactive workshop tool and a guidebook with activities that help users understand what affordable housing is and what it means for their neighborhood. 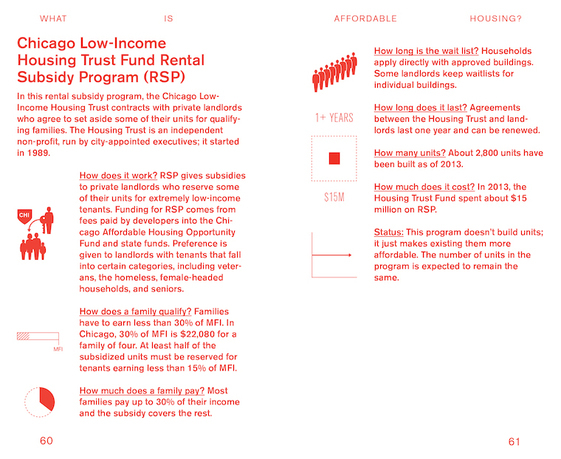 It explains Chicago's housing policies and programs and whom they affect. The Center for Urban Pedagogy develops, tests, and distributes the toolkit in collaboration with diverse community groups whose constituents are impacted by housing decisions. The Center for Urban Pedagogy (CUP) creates tools for community education such as the Envisioning Development Toolkits, which address urban development issues such as affordable housing and zoning, and Making Policy Public and Public Access Design, produced through collaborations of CUP, designers, and advocacy organizations. CUP also provides youth education programs, including Urban Investigations and City Studies, which result in projects from documentary videos to illustrated publications that are further distributed to communities as educational tools. CUP projects appear in public spaces, community centers, and cultural venues such as the Cooper Hewitt National Design Museum, the Venice Architecture Biennale, and the New Museum of Contemporary Art, New York. CUP is a leader in design and civic education, recognized by a Union Square Arts Award, a Rockefeller Foundation NYC Cultural Innovation Award, the Curry Stone Design Prize, the Core77 Design Awards, and the Lewis Mumford Award from Architects/ Designers/ Planners for Social Responsibility (ADPSR). CUP, founded in 1997, uses the power of art and design to increase meaningful civic engagement, particularly among historically underrepresented communities. CUP creates interdisciplinary collaborations that bring together community organizations, advocacy groups, students, artists, designers, educators, and others to improve urban life.